NASCAR Thunder 2004 is a racing simulator by EA Sports, released in 2003 and available in separate versions for PlayStation, PlayStation 2, Xbox, and PC. It features the 2002 champion Tony Stewart on the cover with a scowling look to represent the new Grudges and Alliances feature. 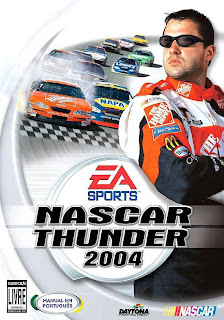 It was the only game as of 2002 to feature the previous Winston Cup (Sprint) Cup Champion on the cover. The game had the most extensive soundtrack of the series up from four songs from the previous game. The game also has a career mode, season mode, Lightning Challenge mode, SpeedZone, as well as a tutorial mode featuringRichard Petty. The game is an EA Sports Bio game, and is compatible with other EA Sports Bio games like Madden NFL 2004 and NCAA Football 2004. 0 Response to "NASCAR Thunder 2004 RIP"